Over the last week, the exterior of our cabin has been getting a new, slick black paint job. 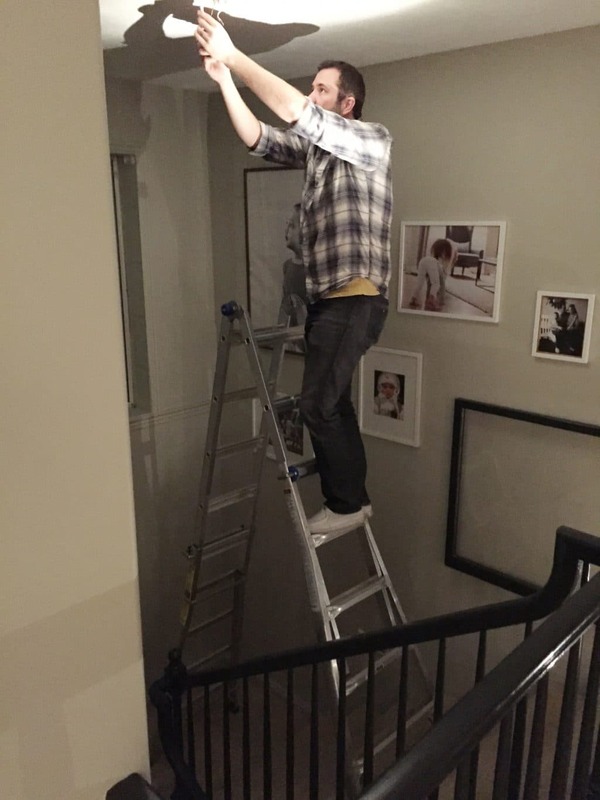 We hired out that part of the painting to avoid getting up on the nearly vertical 25 ft. ladder and we found a crew that would do it all for $1800–worth it! However, we knew we could handle painting the doors ourselves, especially since when they started we were still not sure what color we’d go with. There are 4 sets of doors. These main ones you see that lead out to the upper deck. A pair of similar doors on the lower deck. Our “front door” that’s actually in the back of the house (you can see when we replaced it here) and a door on an upper deck on the back above the front door. 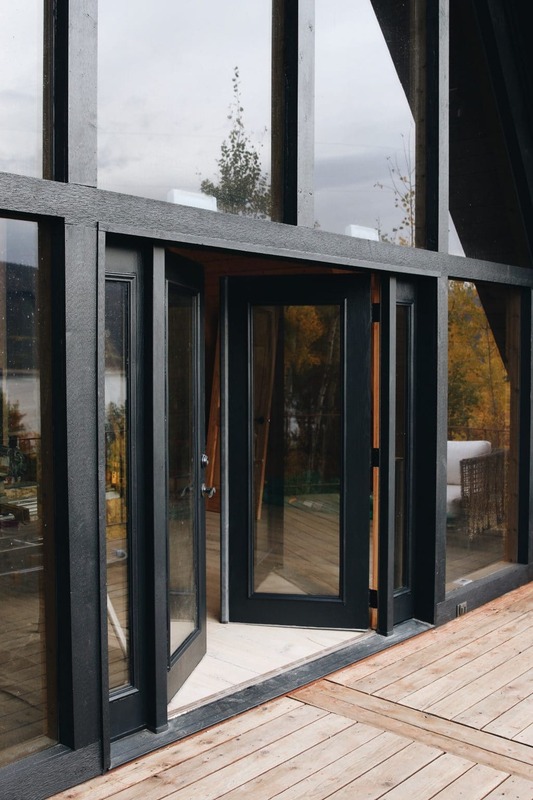 To minimize the look of all of those doors and really put the accent on the windows, we decided to paint them the same black as the exterior–Cabot’s Solid Stain in Black. Before starting, we took a screwdriver and scraped off the old glue around the windows and doors that had seeped out over the years. 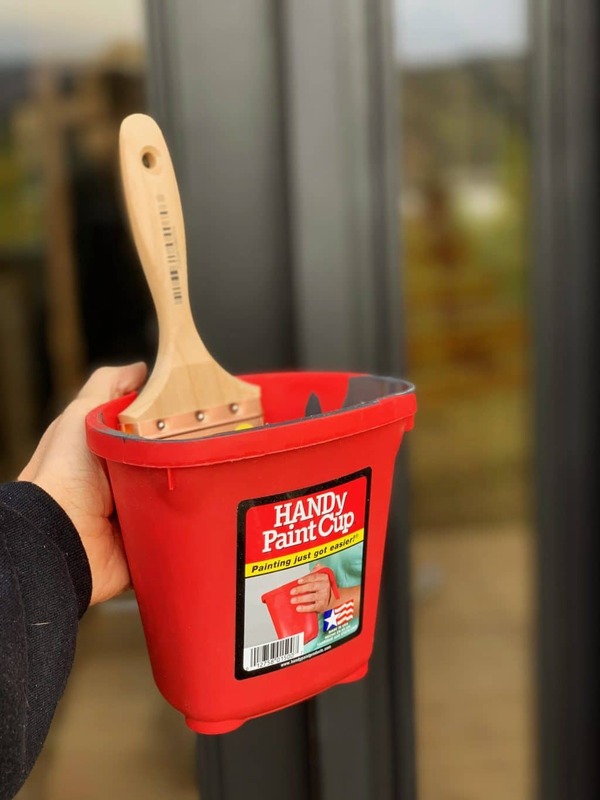 We pulled out our trusty HANDy Paint Cups for the task. It holds up to a pint of paint or stain so Chris and I could both tackle a set without having to make multiple trips to the paint can. And maybe the best part is the magnetic brush holder that keeps the brush from falling into the paint when not in use, keeping our brushes a lot cleaner and lasting a lot longer, too. The exterior paint job is getting finished this week and we promise to give you a full, pulled-back look at the whole thing as soon as they finish up, but here’s a big sneak peek! We have decided to keep the decks more natural; keeping the rustic, worn look and just putting on a clear coat to protect the wood. 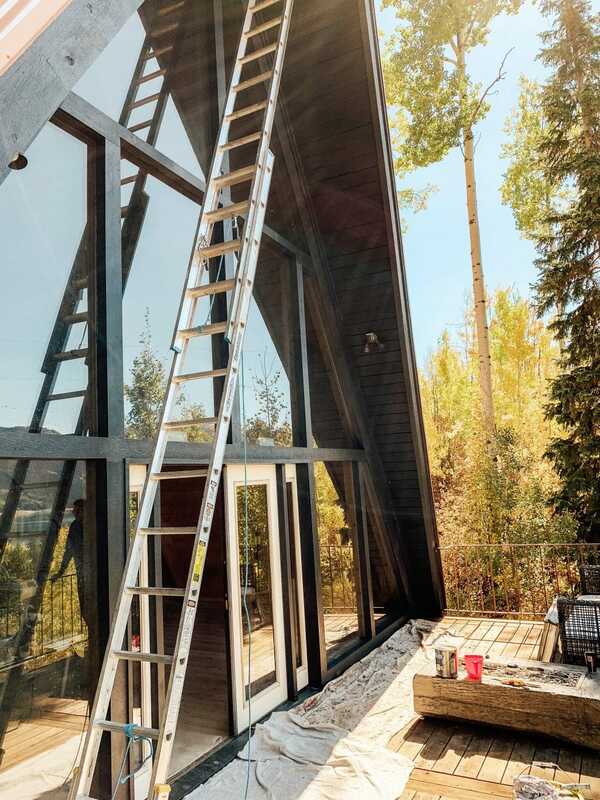 I love the juxtaposition of the more worn wood with the sleeker black exterior. We let the HANDy Paint Cups dry overnight and peeled out the solid stain in nearly one sheet to clean them. So many of you weighed in on colors you wanted to see the doors painted on an Instagram live we did, there were a lot of votes from black, but also dark green, and even mustard yellow. 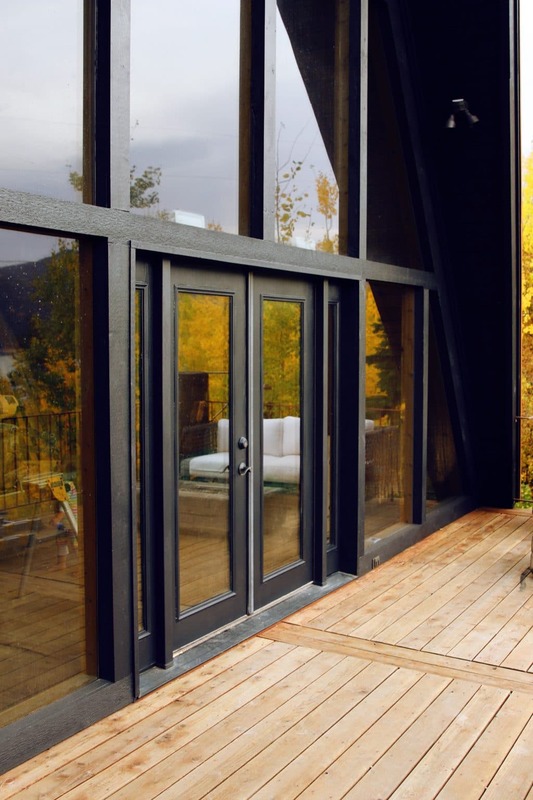 Seeing the reflections of the fall leaves and mountains and water in the windows, we’re so happy we kept the windows the focal point…although I can’t get enough of that black either. I LOVE the black doors. We had considered that for our brand new front doors a few years ago, but found out it would void the warranty. Something about the trim holding in the glass would get too hot from the sun, would expand slightly, enough to loosen the seal with the glass, and the doors would prematurely leak air. Definitely a consideration for a northern winter. I wonder if we were mis informed. I do love love love the look! Just an fyi, I’m pretty sure the glue/caulking around the door windows is going to come back. I painted a door like yours and painted the glass frame to match; it was a deep maroon and looked great for about six months. The white caulking seeped out and I had to keep touching it up. Gah! That black exterior with the yellow tree and wood deck! Love! This looks amazing!! we also have a black house (mcm) and it took me a full few days to get over the shock of such a dramatic change [from army green], but now a year later I know we made the right choice. Instant modernization. Also long time user of Handy pail….for all the reasons listed. 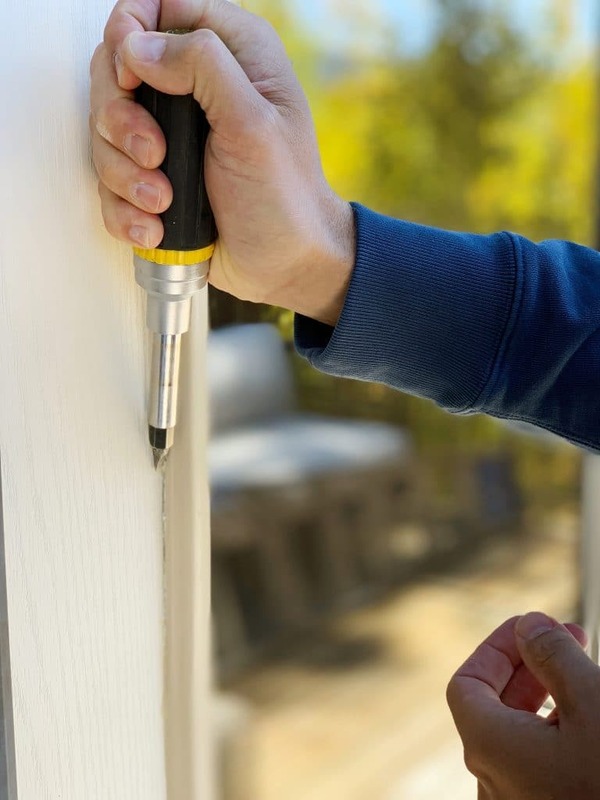 Did you re-caulk the windows and doors before staining them? We don’t have any leaks so we didn’t, but one definitely could. Yaaaaasssss. Yummy. I think all black was an excellent choice. Did you actually paint the doors with the same stain? Yup! It’s a solid acrylic stain that goes on a lot like paint. I love the black! Looks so cool. When you do the full reveal, I would love to hear more about the window tint as well. Good work! 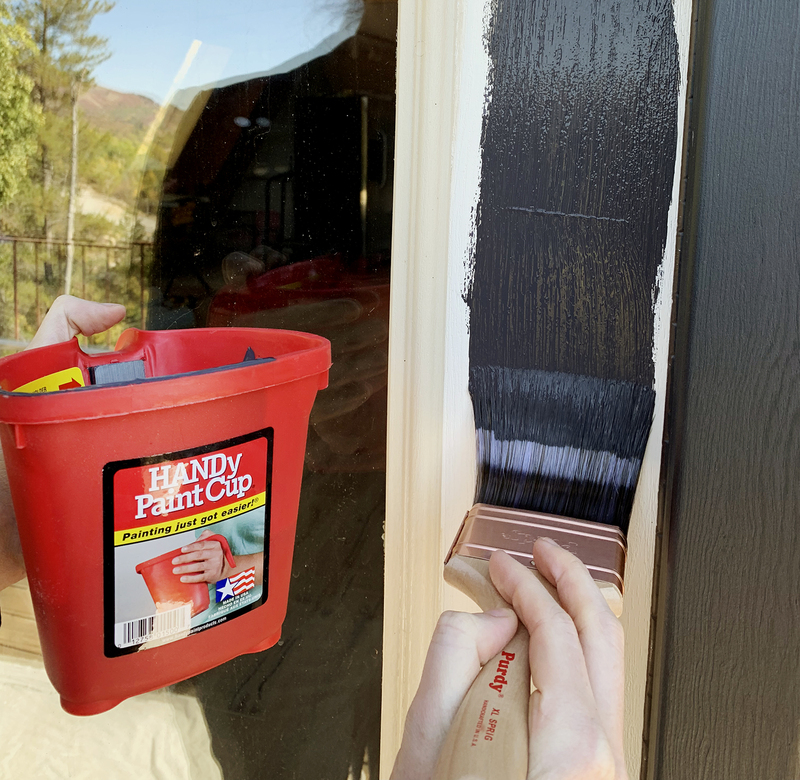 I usually don’t comment about sponsored products, but I’m actually obsessed with using the Handy Paint Pail (it’s the slightly bigger version of this, but basically the same). My husband picked it up for me while we were painting the interior of our house (I edge, he rolls), and I’ve used it on every painting project after that. I honestly wouldn’t paint without it. The brush magnet is so helpful, and the handle saves my left hand from cramping while actually holding something. 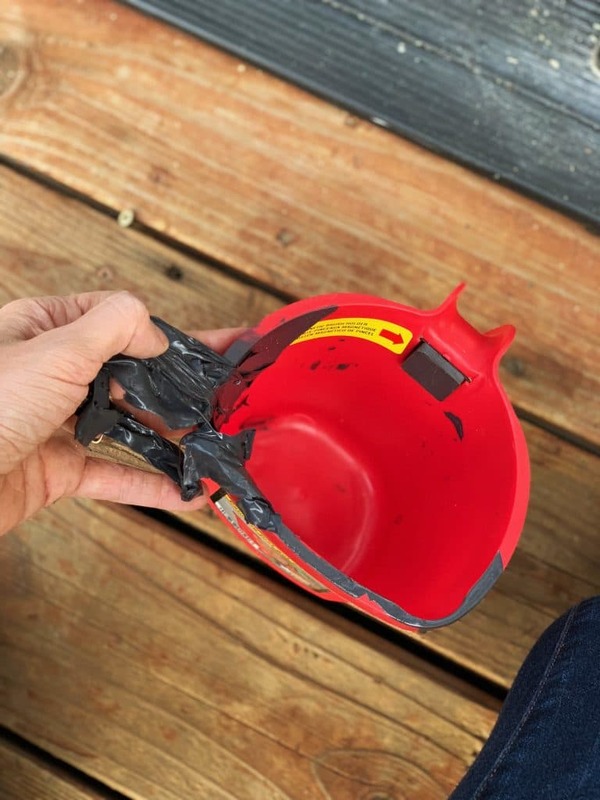 The pail size also has liners that can be tossed after each paint job. 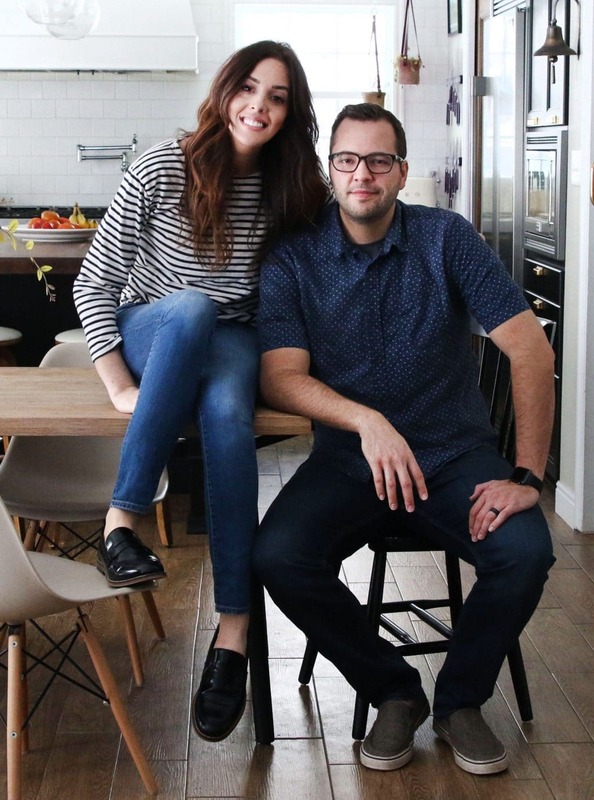 Julia and Chris, you’re place is looking amazing and it’s been so much fun to follow! 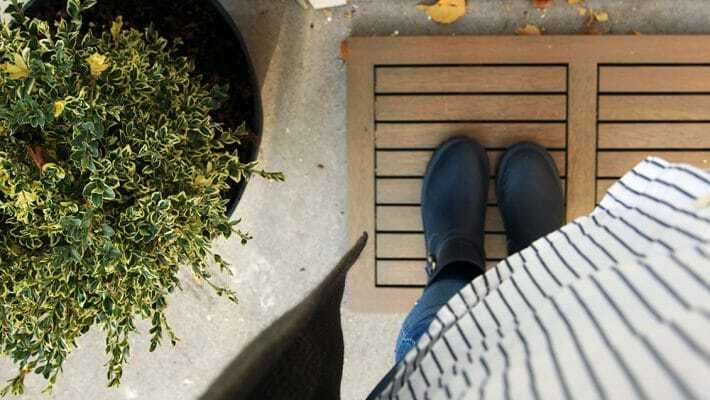 Other than the Cabot stain, do you recommend an opaque paint for an exterior door? Indoors I’ve had luck with BM Advance, but it isn’t suitable for outdoors. If you have any tips on application without unmounting the door I’d really appreciate it. Thanks! Most brands offer an outdoor option – I would just suggest not going with the cheapest. Pay a little more and it will last longer. The sneak peak has me excited for the full view! 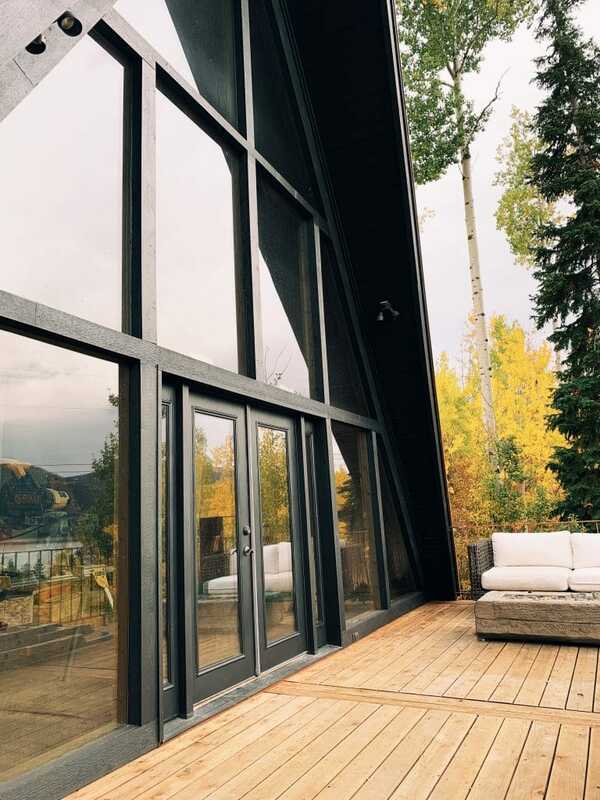 The black is making the windows shine and nicely reflect the nature. Had always used an old sour cream container for paint, not wanting to spend a few extra bucks on the “fancy” paint bucket. BUT IT’S TOTALLY WORTH IT! I have the Handy Paint cup now and painting and cleanup is much easier and cleaner. Have you tried a dry wall taping knife for the trim? I think that’s what it’s called? It’s between 8-10 inches and looks like a long a skinny putty knife, it’s pretty much a long rectangle thingy that you can put between the carpet and the trim to hold the carpet away from the trim while you paint it and then you can slide it down to the next area to paint. Life saver for me when I would paint trim!! No, I haven’t. Thanks for the suggestion, Debbie!